For a complete discussion of these genealogies, see Skene's "Celtic Scotland", Vol. 3; and "The Highland Clans," Vol. 2. A discussion of the clans in descent from Clan Donald in Argyle may be found in "Memorials of Argyleshire." From the peculiar condition of society among the Highlanders, the investigation of family history becomes an important instrument in ascertaining and illustrating the leading facts of their origin andhistory. The attention of the Club will, consequently, be in a considerable degree directed to this object; and it is proposed to include in the Collectanea, a series of the Genealogies of Highland Clans which are still to be found in ancient MSS. In the present number, the series commences with the contents of the most ancient Genealogical MS. now known to exist. It was discovered, accidentally, in the Advoate's Library last year, and consists of eight parchment leaves, the last of which is covered with genealogies, written in the old Irish character, but so very much faded by time as to be read with great difficulty, and, in many instances, to be altogether illegible. Of the authenticity of the MS. there can be no doubt, and a strict comparison of all the genealogies contained in it has satisfied the editor of its general accuracy. The same careful examination shows that it must have been written about the year 1450, and this conclusion, with respect to its date, was afterwards corroborated by discovering the date 1467 written upon one of the leaves. The author of the MS. appears to have been a person of the name of Maclachlan, as the genealogy of Clanlachlan is given with much greater minuteness than that of any of the other clans; and the various intermarriages of that clan alone are given. From this it seems probable that it once formed a part of the well-known Kilbride Collection, which was so long preserved by the family of M'Lachlan of Kilbride. Although a greater proportion of the contents of this MS. has been deciphered than was at first anticipated, a considerable portion still remains, so much obliterated by age and exposure as to he in a great degree illegible. Should any further progress be made in reading these parts of the MS., the result will be communicated to the Club, on a future occasion. It would occupy too much space here to enter into any detail of the very important effects which this MS. must produce upon the question of the origin of the Highland clans; it will be sufficient to state that it seems to establish three very remarkable facts - 1st, The existence, at a very early period, of a tradition in the Highlands of the common origin of almost all the Highland clans; 2dly, The comparatively late invention of many of the traditionary origins of the different clans at present believed; and, 3dly, The mutual relationship of various clans which have hitherto been supposed to be altogether unconnected. It will be altogether impossible, in the limits of this branch of the Collectanea, to illustrate these curious genealogies as we could wish, or to do more than occasionally point out where the MS. is corroborated by record or history. David filius Maelcolain f. Donnchada qui fuit nepos Maelcolain f.
f. Fergusa f. Eirc f. Echach miraremuir f. Oengu saphir f.
f. Fiacracheathmail f. Echdachriada f. Conore f. Mogalanda f.
f. Maine f. Forgo f. Feradaig f. Elela arami f. Fiachra firmara f.
original MS. in Pinkerton's Enquiry, I. 479). has been annexed. mc Eirc mc Eachach muinreamhair. the Irish Annals will establish its accuracy. 1058 Lulach mac Gilcomgain ardri Alban. Ibid. 1032 Gilcomgan mac Macbrig Maormor Murebe. Ibid. Macbiad mc Finnleic mc Ruaidri mc Domnaill mc Morgain. ic Muiredaig ic Loairn ic Eoch. muinreamhair. index. Gilchrist Macnauhton had a grant from King Alexander III. Conlait son of Ferchar fada son of Feredach. the improbably fiction of their descent from Macduff, Thane of Fife. ic Donaill duinn ic Fearchar abradhruaidh ic Fearadaig. Donald duin son of Ferchar of the red eyelid, son of Feredach. mc Fearchair fada ic Fearadaig fin. fada son of Feredach the white. Gillmartan moir ic Gilla camsroin. Martan og, son of .... son of Martan mor, son of Gilla Cameron. Gaelic as the Siol ic Maolonoy, or ic Gillonoy. ic Digail ic Pauilac mc Art ic Angus moir ic Erc ic Telt. seems to have been a branch of the clan Lauchlan. Donald duin son of Feradach fin. son of Adam son of Gilleoin og son of Gilleoin of the Aird. son of Mathan son of Keneth &c.
that its conclusion is to be sought for in that immediately preceding. stated in the account of the parish of Eddirachylis.- Stat. Acc. Eirc ic Loirn ic Fearchar mc Cormac ic Airbertaig ic Feradaig. son of Merve son of Arthur son of Uther (Pendragon). Carla ic Domnaill og ic Domnaill duinn ic Fearadaig. of the Mackays of Strathnaver, who are in Gaelic called clan Mhorgan. son of Ferchar fada son of Feredach. 12th April 1463.- Registrum Magni Sigilli, lib. vi. No. 17. Disiab mc Fearchar ic Finlaeic ic Nicail ic Maine ic Muirecc. Finlay son of Nicol son of Maine son of Murdoch. Finlaeic mc Fearchair fada mc Fearadaig mc Fergusa. Ferchar fada son of Feredach son of Fergus. 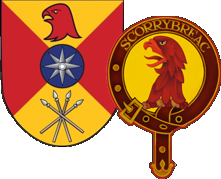 of Cormac son of Oirbertaigh son of Murdoch son of Ferchar og. Donch ic Dubgaill, Persuin ic Dubeiran ic Donch. son of Duberan son of Duncan. The line "mc Anradan conerguid clanna Niel nai giall"
Anradan where it converges with the Clan Neill Nai Giallach." in this group of descendants of Anradan. ic Donmaill mc Somarle ic Fearchar mc Dunsleibe ic B.
son of Dunsleve son of Buircce. Domnaill og agus Eon agus Angus agus Alex III ic in Galtra .i. Eoin sprangaigh ic Angusa moir. Somarle agus Ailin agus Alx og IIII ic Eoin ic Donch ic Dubgail. of John son of Duncan son of Dugall. Macdougals of Lorn. "John macalan of Lorn, called Macdougal,"
mc Eon ic Donch ic Dubgaill. Clan Donald, and Clan Dugall. confounding of two distinct genealogies. Ragnall Angus trat nir fagaib clann mac agb ata sil. Column 5th, omitted in the First Part, but now decyphered. son of Eadgar, son of Ath. ic..... ic Maine ic Ile. ...... son of .... son of Maine, son of Ile. presumed, are the MacVicars of Argyllshire. ic Luit mc Oilila ic Fiach mc Enadritor mc Modha Nuadhat. Corc Mac Luit, King of Munster, in Ireland. Martin the Brown, son of Neillgusa of Lochaber. in Ms. 1450                 from Irish Ms.
.... son of Cormac, son of Oirbertaigh. Gillaagam mor a fuilid clann mc Cormac mc Oirbertaigh. or Lamont." It is the pedigree instead of the MacLennans. See the MacLennon Pedigree from Celtic Scotland. Maelsig mc Gilleain mc Icrait ic Suan ic Neill ic Domlig i.
son of Colman, son of Buadan, &c.
penes Highland Society of Scotland. son of Adam son of God. Conaill Cl. dearg mic Ceallach mic Mardoid re. r. in. mic l.
laidare o.r. Clann l. mic Fergusa leit dearg.